The Bar Association of India, on Thursday, hosted the annual M. C. Setalvad Memorial Lecture at the Hotel Hyatt Regency in New Delhi, with Chief Justice Dipak Misra, enlightening the audience on the “Dynamic Ascendance of Constitutional Rights- A Progressive Approach”. Describing Setalvad as a “legend”, Chief Justice Misra remarked how we were “humbled”, not “privileged”, to have been invited to deliver the lecture in his memory. He recalled how Setalvad, the then Attorney General of India, had declined to take Justice H. J. Kania’s place as the CJI, in honour of his friendship with the judge. “William Shakespeare, in one of his plays, wrote, ‘Kill all the lawyers!.I am of the strongest opinion that had Shakespeare written the play in the 20th century, he would have said ‘long live the lawyers!’”, remarked the Chief Justice in the context of Setalvad’s integrity as an advocate. He reminisced how even before the Advocates’ Act of 1961 was introduced, Setalvad had, upon once appearing before his father on the Original side, understood the impropriety of it and refused briefs in that behalf. The judge also hailed Setalvad as being the sole lawyer who returned the fee if he was unable to attend the hearing for any reason. Reflecting that the “Dynamic Ascendance of Constitutional Rights” is “a homage paid to the divinity of the constitutional rights”, the Chief Justice commented that these rights would become a dead letter without pragmatic interpretation. “The rights have to be developed in such a manner that they extend to the lowest wrong in the society”, the judge observed, adding that static interpretation of the rights would stunt the spirit of the Constitution. Chief Justice Misra stressed on the need for commitment on the part of the State and concreteness of its action in implementing the rights while noting that the Supreme Court, as the final arbiter of the Constitution, is the protector of the rights granted under the constitution. “The Supreme Court has realized its role quite early”, he commented. Elaborating, Chief Justice Misra advanced, “A Judgment by a seven-judge bench discarded a particular provision as being violative of the constitution- the provision has to flow from the constitution and nowhere else, it was held. Then another five-judge bench said that the spirit of the constitution can come from its silences as well. There was no conflict between these two judgments”. Explaining the distinction between Constitutional rights and Fundamental Rights, he advanced that the former are the genus, including not only the Fundamental Rights guaranteed under the Part III of the Constitution but also such rights as under Articles 243E, 243T and 300A. In Madhya Pradesh, by way of an amendment in the M.P. Municipal Corporation Act, 1956 and the M.P. Municipalities Act, 1962, the reservation in the local bodies in favour of women was enhanced from 30% to 50%. In Ashok Kumar Malpani (2009), the Chief Justice, then a judge of the High Court, had upheld the constitutionality of the amended provisions in the backdrop of Articles 14 and 15. 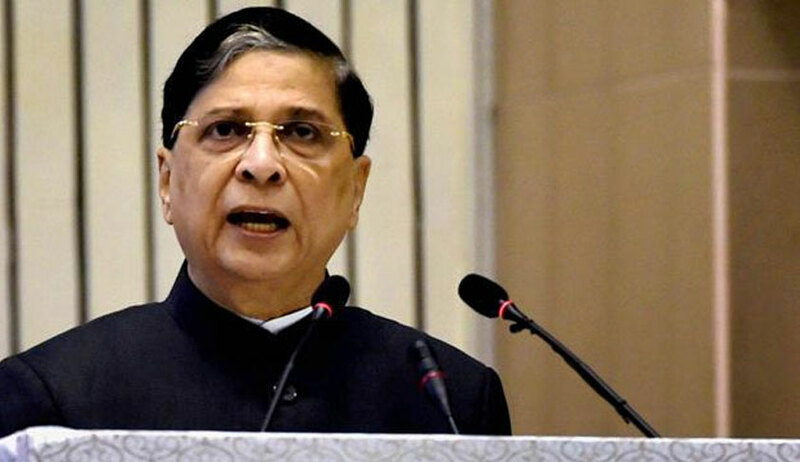 “The argument was that the ladies are not capable of administration and shall depend on their husbands for the same.I had used the terminology that the argument is ‘preposterous’.The matter is before the Supreme Court and a stay was granted, but I will not hear the matter.”, asserted Chief Justice Misra to much applause. “If a member of the citizenry feels that his right has been affected, it is the duty of the court to examine that feeling within the constitutional parameters and, I add politely, with the assistance of the bar.”, echoed the judge. “In the Triple Talaq case [Shayara Bano v. UOI (2017)], we have made this progress that even a legislation can be called unconstitutional, that an Act could be arbitrary per se”, he continued. Moving on to discuss Article 19, Chief Justice Mishra opened with Romesh Thappar (1950), where the freedom of speech and of the press was held to be the foundation of a democratic government. Also mentioned was The 2015 judgment in Shreya Singhal, in which section 66A of the Information Technology Act, prescribing punishment for sending offensive messages by a computer resource, was struck down in the light of thefar-reachingg questions pertaining to Article 19(1)(a) that were raised. “ADM jabalpur has been overruled [in Justice K. S. Puttaswamy (2017)], but the dissenting opinion of Justice (H. R.) Khanna still rings a bell...that you must understand the Universal Declaration of Human Rights”, continued the Chief Justice. In so far as Justice V. R. Krishnaiyer had, in Jolly George Verghese (1980), in examining the soundness of section 51 of the CPC, referred to Article 11 of the International Covenant on Civil and Political Rights, Chief Justice Misra glorified the “innovative thought of the judge” as being “the vision on the path of ascendance”. He indicated his own observations in Dr. Mehmood Nayar Azam v. State of Chhattisgarh (2012), where the apex court had sympathised with a doctor, humiliated in custody for ushering in awareness among the down-trodden which had caused discomfort to the mafia, politicians and state officials having a vested interest in the coal mine area. He had sought compensation under the public law remedy, but the High Court had required him to submit a representation to the State Government for adequate relief, in respect of the grant of compensation after the expiry of 19 years, with a further stipulation that if he is aggrieved by it, he can take recourse to requisite proceedings under the law. Upholding the right of a man to a life with dignity, the Supreme Court had awarded a compensation of Rs. 5 lakhs. He highlighted the upholding of the freedom of choice in the Hadiya and Shakti Vahini (honour killings) cases. In as much as the dignity of the dead and their right to be accorded the same degree of respect as when alive is concerned, Vikas Yadav v. State of UP (2016) was mentioned. “To deny people their human rights is to challenge their very humanity”, the Chief Justice quoted Nelson Mandela. “So nobody can deny human rights as they are entrenched in our constitution as that is why we use these terms interchangeably”, he concluded on an enigmatic note. The evening was graced by the presence of Acting Chief Justice of the Delhi High Court Gita Mittal, NGT Chairman and Former Supreme Court judge Justice Swatantra Kumar, Former Attorney General Ashok Desai, and President of the BAI and Senior Advocate Lalit Bhasin.